These sub plans work for any grade with a text book, but it works especially well in upper elementary, middle school, and high school classes. Students work in groups to preview a section of a textbook. 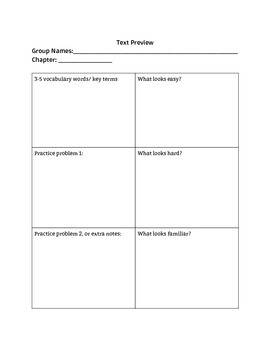 All the sub has to do is assign the partners/groups (if the teacher hasn't already), and then assign each pair/group a section in a chapter to preview. This should take up a whole period of a subject while students study their section and fill out the worksheet. This activity can be extended into a second day if needed. Students present their section and share what they found. Presentations should run 3-5 minutes, and therefore should take up a whole period the next day! The students really do come up with great tips for their peers as well, and become experts on the section, so it's a win-win.